On Friday I mentioned that there would be drinking of gin and sewing. 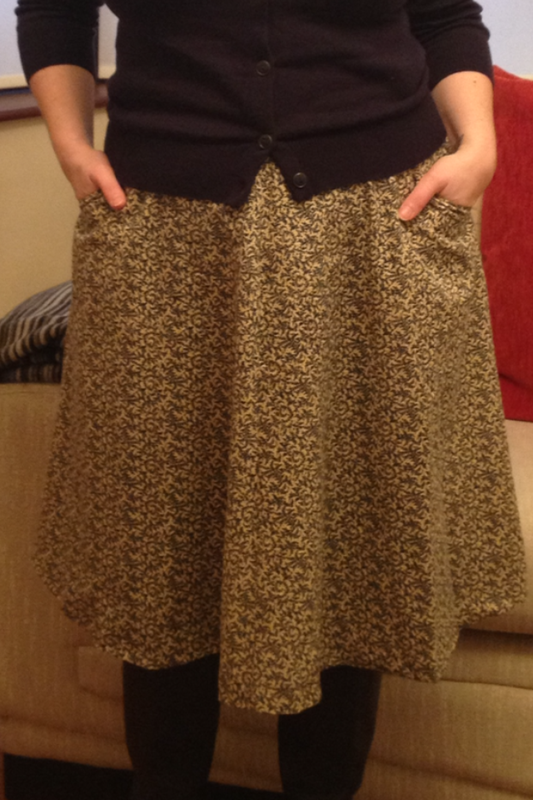 I did indeed sew a skirt. the skirt is the Sewaholic Hollyburn. I cut the paper pattern out on Thursday evening and settled down to cutting out the fabric on Friday. I didn’t rush this stage, with the words of a dressmaking tutor in my head ‘spend longer on cutting than you would sewing’. Now I must admit that I’m not fan of the cutting stages, it makes me nervous, its so final and it takes a long time. I impatient and want to get on and sit at my machine and sew. It was gone 11pm when I finished and there was no way I could sew successfully at that hour. Reluctantly I left it and drank more gin. I did the bulk of the sewing on Sunday evening listening to the Les Miserables film soundtrack. The instructions were easy to follow, the skirt construction had nothing I hadn’t already tackled in evening classes or weekend courses. I’d also been following mymessings sewalong so had a good idea what I was up to. It came together easily. I deviated from the pattern instructions and followed My Messings French seam tutorial. This gave the inside of the skirt a lovely neat finish and one I’m very proud of. I decided to hand sew the hem and finished it last night so I could wear it today. I will definitely make this skirt again, already I’m planning a solid colour version with a contrasting patterned pockets and maybe some piping on the waist band. Me, in the skirt. I’m wearing it with a navy cardigan and dark brown boots.